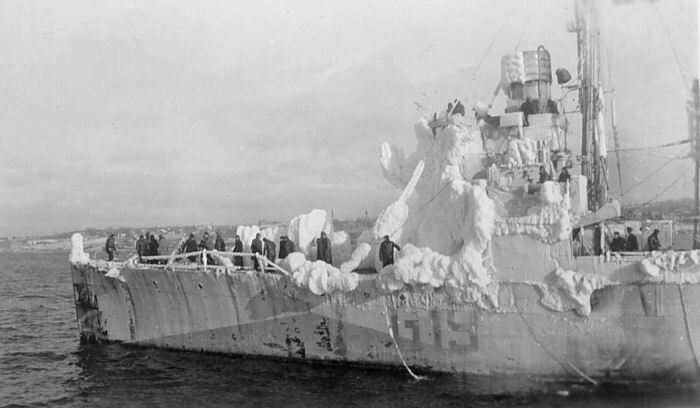 HMS LEAMINGTON was one of the 50 ex-USN "flush deck" destroyers given to the Royal Navy during the Second World War. Not known for their stability, ice build-up such as that which occurs on the North Atlantic during winter can become dangerous very quickly if nothing is done about it. 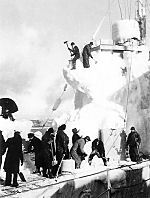 The photos here show LEAMINGTON returning to Halifax in January 1943, with a heavy ice build-up and the crew struggling to remove it. 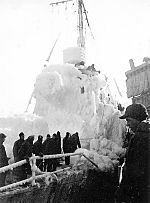 LEAMINGTON had only just left port, and was forced to return due to the icing problem and the list that developed as a result. 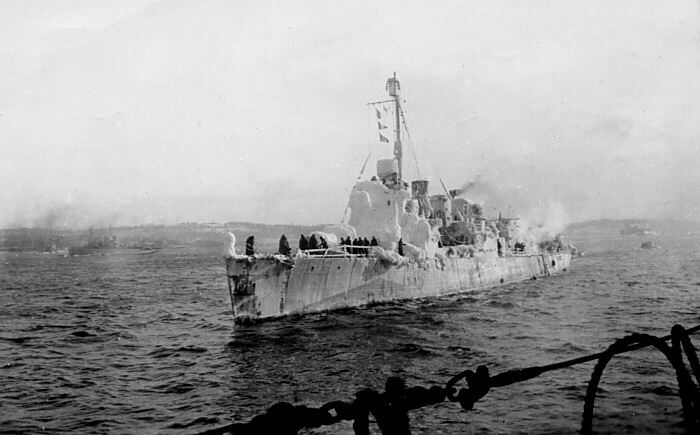 With the anti-submarine boom closed that night, LEAMINGTON had to wait until morning to enter the safety of Halifax Harbour. 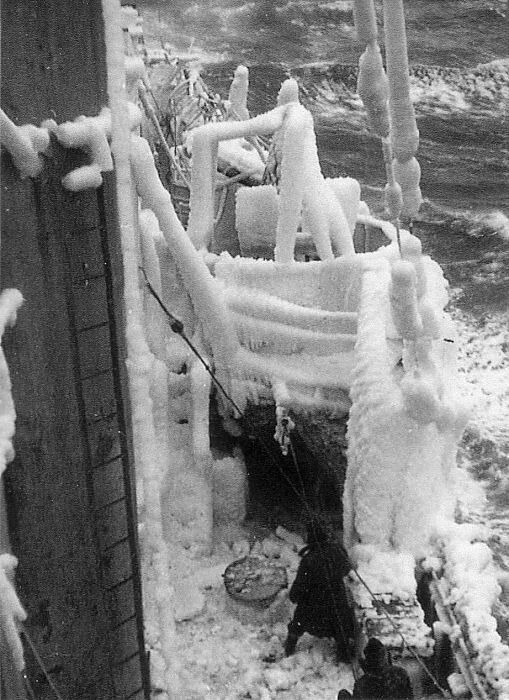 Also included are some photos of LEAMINGTON ice covered in St. John's, and detailing various other incidents. 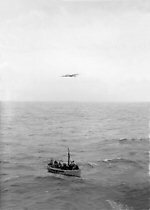 Thanks are due to Phil Marley for sending many of the photos and information, as well as Gord Condie, Bill Croshaw, and Ken Buckley. 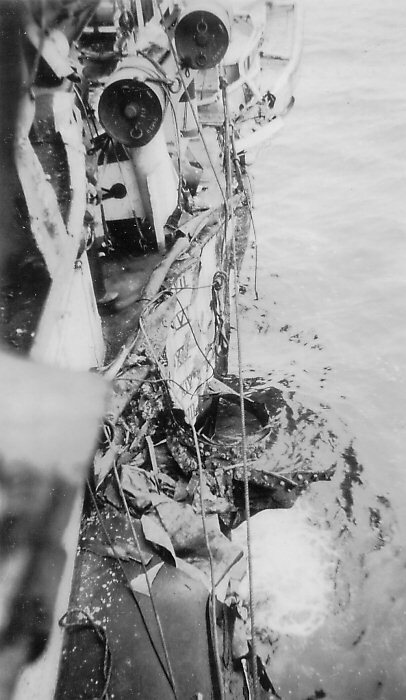 Looking aft along the port side, with a funnel to the left of the photo. As can be seen, the diameter of the cables has been increased many times by the thickness of the ice. Photo courtesy of Phil Marley. Again looking aft along the port side, this time from deck level. 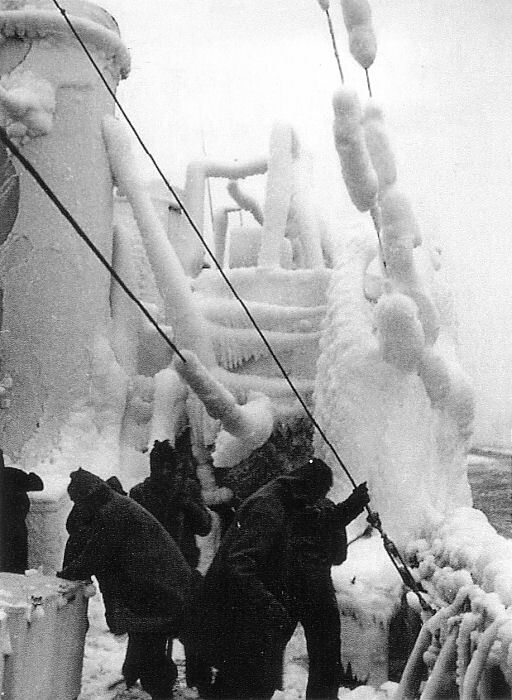 The ship still at sea, some of the crew is shown trying to clear off some of the ice. Photo courtesy of Phil Marley. 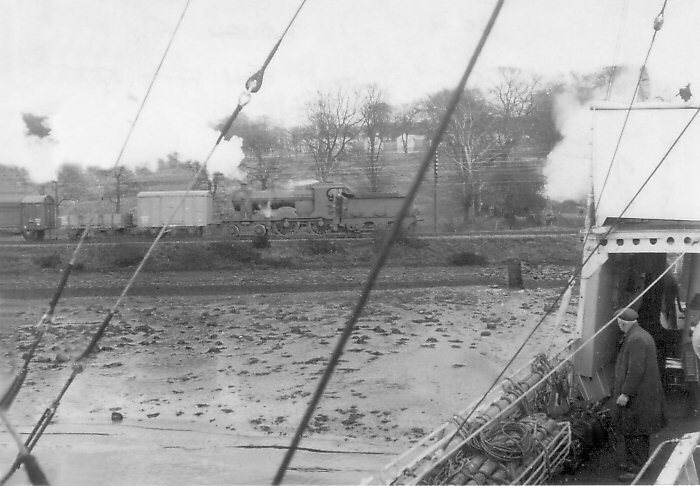 LEAMINGTON returns to port, and is shown coming alongside a sistership. Photo courtesy of Gord Condie and Bill Croshaw. 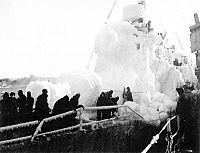 The ice is particularly heavy on the bridge superstructure and other forward surfaces, and has rendered the forward gun completely useless. 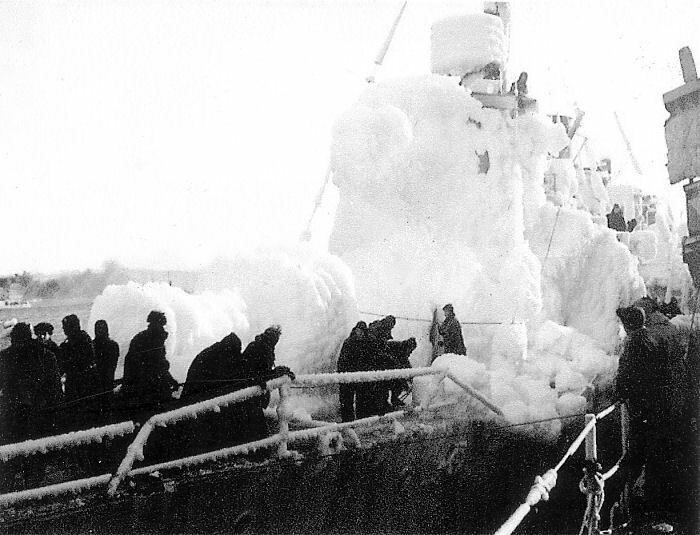 Also note the skin of ice on the forward edge of the radar enclosure. Photo courtesy of Gord Condie and Bill Croshaw. 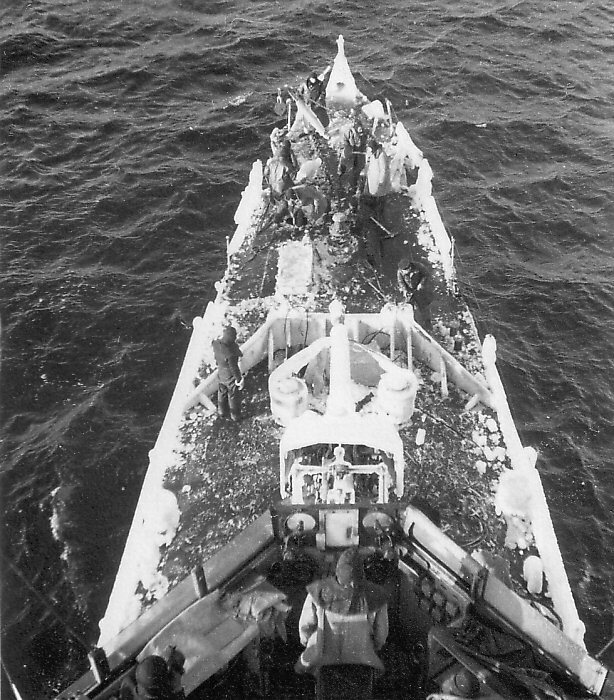 An outboard view of the area of the ship shown in the first two photos of this collection. Photo courtesy of Gord Condie and Bill Croshaw. 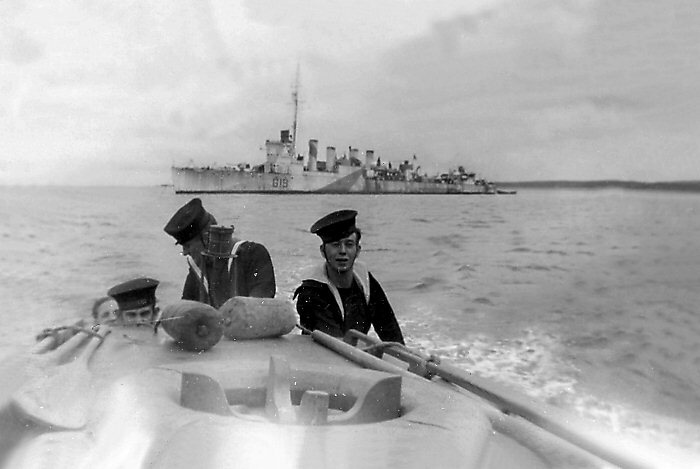 LEAMINGTON's crew mans the lines as she comes alongside another destroyer. It appears as if parts of the rail have collapsed under the weight of the ice. Photo courtesy of Phil Marley. Photo courtesy of Phil Marley. Although the crew has apparently removed ice from some equipment, such as a forward winch, the forward 4" gun remains unrecognizeable under a mass of ice. Photo courtesy of Phil Marley. LEAMINGTON's crew removes ice from the foc'st'le and bridge area with shovels and axes. 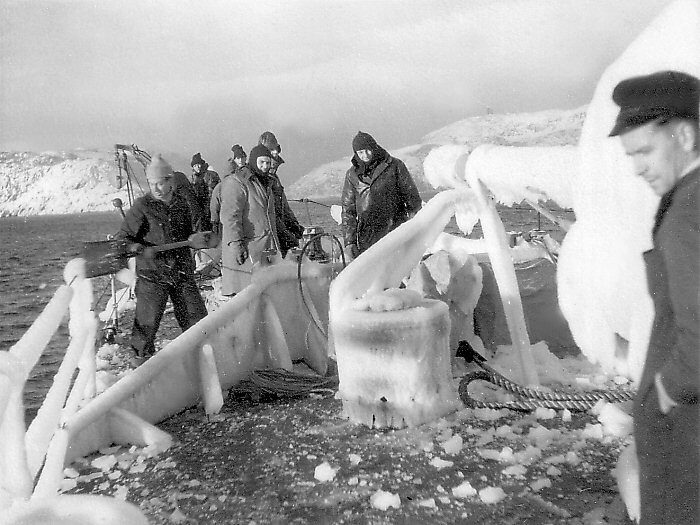 Phil's father is one of the two men breaking ice on the bridge superstructure. Photo courtesy of Phil Marley. 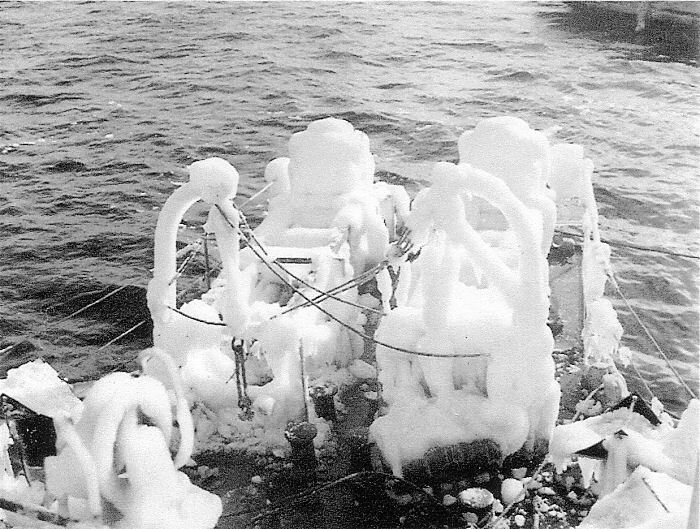 Even the depth charge rack at the stern is completely covered in ice. Photo courtesy of Phil Marley. 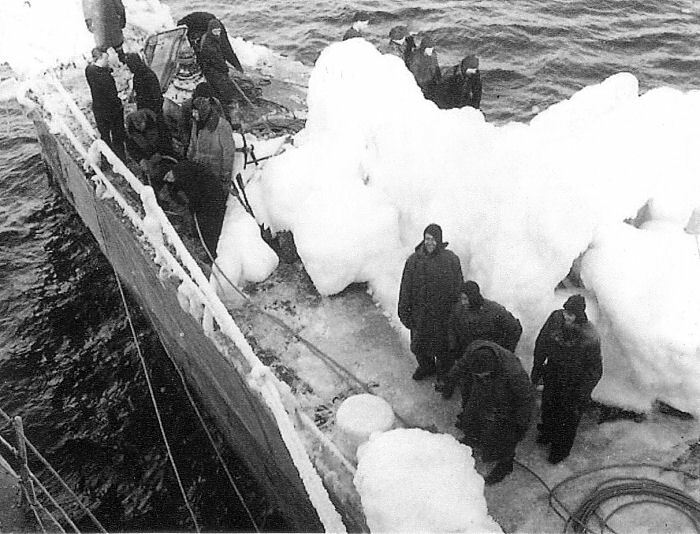 A group of LEAMINGTON's stokers gathered on deck during the Spring of 1943. 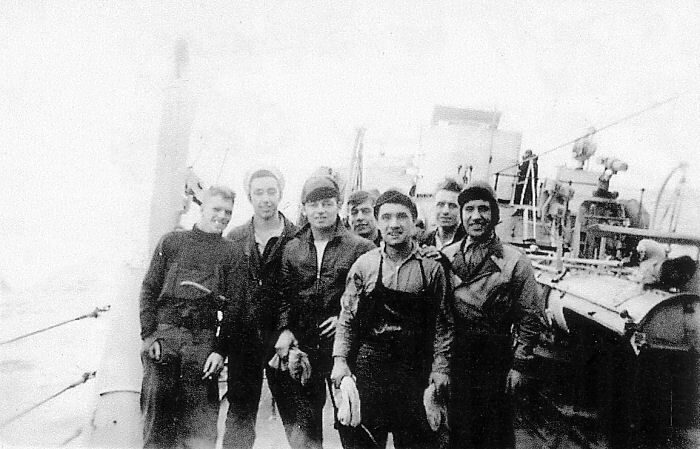 The man second from the left is reported to be Stoker First Class Ken Buckley. Photo courtesy of Phil Marley. LEAMINGTON covered in ice, this time in St. John's, Newfoundland, with Signal Hill in the background. Photo courtesy of Phil Marley. LEAMINGTON covered in ice, this time in St. John's, Newfoundland. Photo courtesy of Phil Marley. 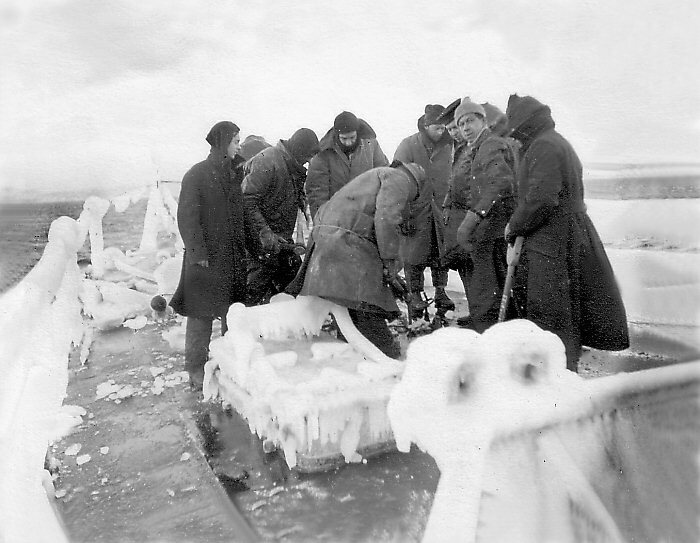 A view of LEAMINGTON's foc'st'le from the crow's nest, showing some of the crew breaking ice that has frozen to the rails and various fittings. Photo courtesy of Phil Marley. Entitled "Gasoline Gig away", apparently shows the ship's gig headed ashore for gasoline. LEAMINGTON is pictured in the background. Photo courtesy of Phil Marley. 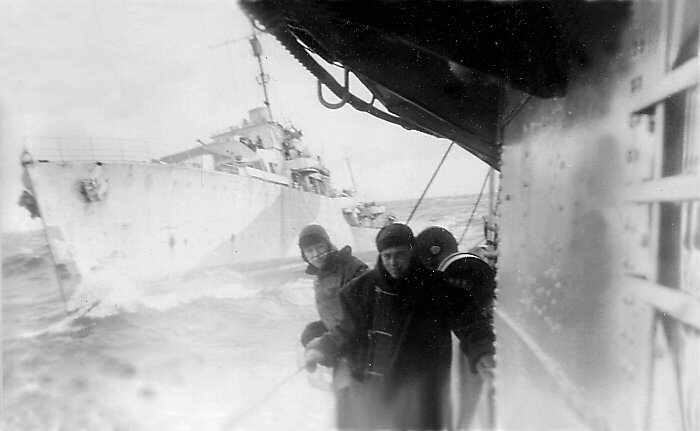 Looking forward along the port side while in Loch Foyle in Northern Ireland in November 1942, after the steering gear apparently failed. Photo courtesy of Phil Marley. S.S. Buchanan was sunk by U224 in November 1942, and LEAMINGTON was directed by patrol aircraft to pick up survivors as pictured here. Photo courtesy of Phil Marley. On May 12th, 1943, LEAMINGTON was rammed towards in the aft port quarter by the S.S. Mortimer, suffering extensive damage to the hull and propeller shaft. 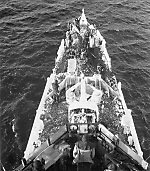 The two port depth charge throwers can be seen towards the top of the photo, with one partially torn loose from the deck by the collision. Photo courtesy of Phil Marley. 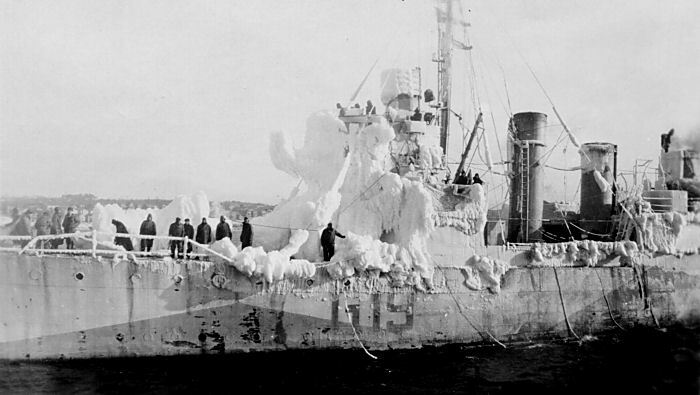 HMCS ASSINIBOINE pulls up alongside LEAMINGTON. Photo courtesy of Phil Marley. Copyright © 2005-06, Sandy McClearn. All Rights Reserved.